Check out all the exciting News from Appel Farm! Articles, photos, stories and event updates can be found in Appel Farm’s Featured News, Blog and Pressroom sections! Stay in touch with what’s happening even more – join our email list on the request information page or check out our Facebook page! We are always interested in reading about the ways that Appel Farm has impacted your life! If you would like to share your story about Appel Farm on our Blog or if you have written about us on your personal blog, website, or in print form, please email our Director of External Relations, Heather Yelle, at [email protected] so we can share your story with all the people who care about Appel Farm! 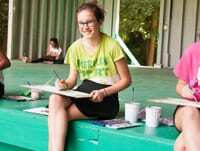 Appel Farm Arts & Music Center is highlighted on numerous websites and major press outlets. Check out what the world is saying about Appel Farm! Our staff, board, friends and supporters love sharing exciting stories on Appel Farm’s Blog! We hope you will enjoy their posts! Welcome to the Pressroom of Appel Farm Arts & Music Center’s website. Writers, bloggers and editors – find press releases about Appel Farm events on this page!